Like Jeremiah, whom we heard of last week, Habakkuk is a prophet to Judah, thought to be active after the Assyrian conquest and into the aftermath of the Babylonian captivity. It was a time of intense national calamity. There are internal troubles – wrong-doing, strife, contention – and very big external troubles looming in the form of the Chaldeans of Babylonia. Within the span of a few generations, the Assyrian army marched through the land formerly known as Israel, and then Judah, destroying one city after another, brutally killing as they went (701 BCE), followed by the Babylonians under king Nebuchadnezzar, who attacked Jerusalem three times – first taking the leaders and skilled citizens into exile, and then in 587 BCE, destroying the city and the temple. Violence was everything, everywhere. We can imagine the cultural, social, spiritual chaos as their nation was deconstructed and depopulated. Naturally, Habakkuk is dismayed by this response. “Are you not from of old, O Lord my God, my Holy One? … Your eyes are too pure to behold evil, and you cannot look on wrongdoing; why do you look on the treacherous, and are silent when the wicked swallow those more righteous than they?” And so, as chapter 1 closes, God has become the problem. What happens when you pray to God and God doesn’t seem to get it? Doesn’t hear? Doesn’t respond? In Israel’s history, this prophet’s message will be followed by many more years of violence, suffering and injustice. This divine response for the people God has chosen and loves challenges all the easy answers or quick fixes that we actually pray for in our own lives. Deliverance will come, but / and – you can do nothing to hasten it or understand it. You must wait. This first Sunday of Advent finds most of us waiting for something – looking forward to it or dreading it, but waiting… Sometimes waiting becomes our life: not only in lines at the store and in traffic – or the lifetime it seems to take waiting for the results from a lab test or word from a loved one. Waiting seems to become life itself, a perennial looking forward to something better, for this current stasis to end. The waiting life can be one of chronic discontent or disregard for the moment. We wait in fear or worry or disquiet for the future, for endings, for death. We wait eagerly for the next stage of childhood, for the completion of a huge project, for retirement. Many of us wait for some future time when everything we have worked for and daydreamed about will come into being and life will be perfect. Right? Hand’s up for those who’ve gotten there! I can’t tell you how many versions of this wonderful-daydreaming-wait I’ve constructed for life at our little farm in Washburn. Then the house is done, the tractor starts, the fields are intentionally managed, the garden is a miniature copy of the kitchen gardens and orchard at West Dean College in England. In my imagined life, Mike and I are waiting for the sauna to get hot and that’s about it – everything else is good. The main problem with my waiting life is that in my plans I’m still 38. Time passes. What am I doing in the meantime? Our response to “Wait for it” might be to sit and let it come, or to fuss and pine about the way it tarries, or to scurry around being busy – waiting and denial being one and the same. The word of God that comes to Habakkuk is a terrifying word – that the Chaldeans will crush them and take them and destroy everything his people hold dear, ravaging even the land so that no crop or fig or olive will come to harvest, no flock will make it to the fold. But deliverance will come… eventually….. in the fullness of time…. Wait for it. That’s not what Habakkuk is saying, though. It’s more remarkable than that. It’s not simply that Habakkuk can’t see anything to be hopeful about – he is claiming faith in the nature of God that flies in the face of everything he does see – faith in what is completely contradictory to what he sees. Despair seems the only plausible response in his world view. I worked in Montana one summer when I was in college. I was a backcountry forest ranger intern. And at the end of the summer my roommate and I took two weeks to hike and camp and bike ride through Glacier National Park. I will say without hesitation that riding a bike is not the way to see Glacier – the uphills never end and the downhills are terrifying …. but I digress. My point is that we watched mountain goats and big horn sheep up in the heights where we couldn’t dream of being. Up above tree line, up where it’s just rock and boulder fields and chasms and snow and wisps of clouds – there were baby mountain goats learning to jump. Watching them, I couldn’t imagine how they found footing, how they could find food, how they could survive the winds and harsh conditions. Why didn’t they go somewhere else lower down the mountain to greener pastures, beside still waters, on wider trails? Those young mountain goats didn’t seem to be picking their way, carefully, safely along the trails up there. They weren’t waiting to grow up, or for more favorable conditions, or for the grass to grow at their feet. Their mommas didn’t seem to be giving them instructions in personal safety. The young ones didn’t tread on the heights, they trounced and bounced and careened and pranced … The Lord God gave them remarkable feet, and remarkable instinctual trust. They were a terrifying and joyful sight. I don’t suppose that’s quite the image Habakkuk had in mind, but it gives me an idea for how he felt, for how he trusted. If you’ve ever tried rock hopping you know that feeling. To successfully rock hop a stream or hillside, you turn off the rational part of your brain, the part that thinks about sprained ankles and cracked skulls. You release ‘rational’ and let the intuitive, spacial, leaping, instinctual side take over. It’s a rush. 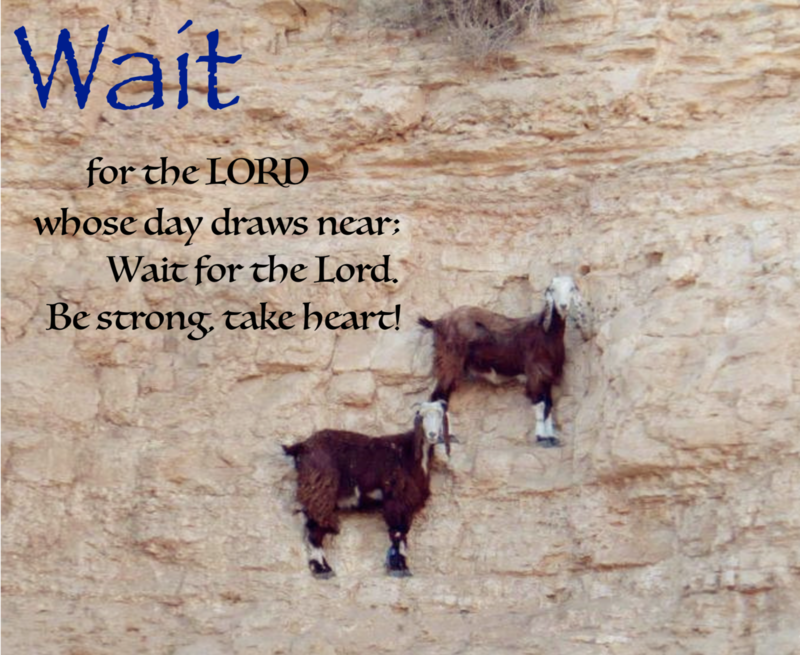 Rock hopping might seem to be the opposite of waiting – and might make waiting sound pretty good – but it gets to the active, radical root of the Hebrew word – God’s word to Habakkuk. Active waiting grounded in hope, letting God guide your life and your future – not knowing where you’ll put your foot down next. In rock hopping, if you think about it it’s too late. Mountain goats calculate on the fly. Waiting in radical hope is trusting that your foot will land, fleetingly supporting, launching you into the next boulder and then the next. It’s an anxious life to imagine for those of us who are pretty well grounded in safety and satisfaction and denial. Radical trust is faith in a God who is active and present, whose deliverance has come and also is not yet here. This first Sunday in Advent, we open the church year waiting…. believing beyond our fears. ← It’s that Cookie Walk time of year!